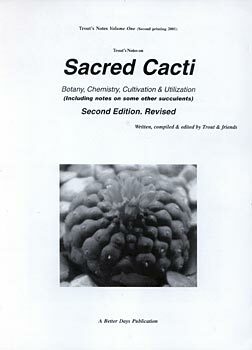 Sacred Cacti Second Edition covers the cactus species reported to contain mescaline and their sacramental histories. Now in its second printing including corrections, updates and over 100 additional illustrations! Beginning with a look at the realities behind the so-called "war on drugs" and its true nature as an ongoing continuation of a long-standing religiously based cultural purge now disguised as a legal and "public health" issue, Sacred Cacti then moves forward to thoroughly cover what is known to date concerning the cactus speceis reported to contain mescaline, their sacramental histories, published chemistry, growth requirements and pharmaconautical applications. It is intended to help both researchers and the reader who is already employing these sacred beings as sacraments and spiritual teachers to better recognize, cultivate, and utilize them. ""...totally professional, scholarly...work. They are going over to the reference shelf in my library, and...will be the place I file bits of information that I happen to uncover. This way...I have a single place to go to get a complete story. They would sell like hotcakes if they were known to be available."